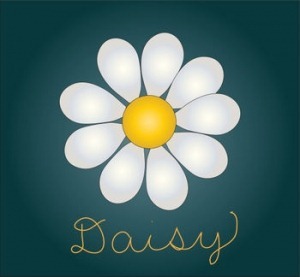 Thanks and hugs to Becky over at Blogs-of-a-bookaholic for passing me the rather lovely daisy award! 2.) Tell your readers 7 unusual things about yourself. 3.) Nominate some worthy bloggers. 2. I like to have a cooked breakfast every Sunday – it’s like a ritual. A yummy one. 3. I have fancy editions of my favourite books mostly Jane Austen. 4. I spent quite a few years thinking people with tattoos were crazy … then I got one. 5. My feet are always cold, even in summer. I’m usually in a pair of fluffy socks around the house. 6. I’m a writer but I don’t make any money from it. Yet. 7. My bedroom is colour co-ordinated in browns and cream, down to cushions and teddies. I hope you enjoy reading their blogs! What is unusual about you? Go on, tell me! Last chance to enter the Joules journal and voucher giveaway, hop over here now! Previous postWhat makes you buy a book? Thanks for passing on the award to me, too. I shall display it proudly! It’s a cute flower! Ooh you have one every day, that’s pretty special 🙂 Mmm pancakes, I’m hungry now. Congrats. That is a pretty award. I don’t think you’re mean. =) And thanks for passing the award. Thanks! Aw that’s good 🙂 It was well deserved! Such a sweet daisy award! Congrats! Thanks hun! Haha I like that saying 🙂 I feel like I’m either too hot or too cold, never just right. Sigh. Congrats on your award 🙂 And thanks for thinking of me. I love daisies! Thanks! No probs, I love reading your blog. Haha it’s probably because you had to share so much when you’re younger! Wait! I don’t think I knew you had a tattoo! What is it?? Some great facts about you there. 🙂 Love the sound of your bedroom, for ages I wanted mine to be brown and cream, but then I suddenly changed my mind and went for red, white and black. (Think it was influence from the Twilight Saga front covers lol :P). Thanks for passing me the award! I’m not a fan of sharing either. And I’m not an only child. I have no excuse.